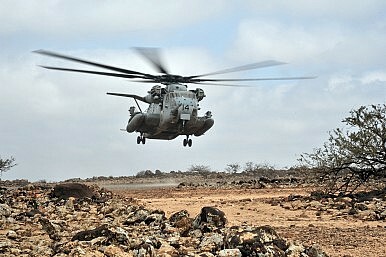 A U.S. Marine Corps CH-53E Super Stallion helicopter assigned to Marine Heavy Helicopter Squadron (HMH) 461 prepares to land at Camp Lemmonier, Djibouti, April 20, 2012. HMH-461 was training its pilots on landing and takeoff procedures while assigned to Combined Joint Task Force-Horn of Africa. China's Naval Plans for Djibouti: A Road, a Belt, or a String of Pearls? As China looks to Djibouti, it may be apparent that Beijing’s “peaceful rise” is showing its claws. Although the People’s Liberation Army Navy (PLA-N) blasted the report as “utterly groundless,” Djibouti’s strongman Ismail Omar Guelleh recently acknowledged that his country is indeed holding high level talks with Beijing for a Chinese naval military base in the northern port of Obock. Is this the first sign that China is serious about developing a blue water navy capable of acting outside its immediate sphere of influence? Is “China’s peaceful rise” starting to show its claws? Much ado has been made of Xi Jinping’s Silk Road Economic Belt and Maritime Silk Road initiative (jointly known as “one belt and one road”), a $140 billion plan meant to expand China’s global reach. Best understood as a circle that originates on China’s East coast and spans South Asia and the Middle East, climbing to Europe via East Africa and the Suez canal, on one side, before returning to its original point via Russia and Central Asia, on the other, the project is an integral part of Xi’s “China Dream” of national rejuvenation. Beijing went to considerable pains to frame the Modern Silk Road (MSR) merely as an economic plan of global proportions that will impact 4.4 billion people and facilitate a jaw dropping $2.5 trillion in commerce over a decade. Despite its massive scale, Chinese Foreign Minister Wang Yi sought to play down the more than $140 billion program’s importance, insisting it was “not a tool of geopolitics.” However, some have expressed concern over the operational level of the project. Even if for many countries included in the MSR, Beijing’s ambitions will bring a welcome economic boost, the project will become entangled in multiple foreign disputes the Middle Kingdom has traditionally sought to avoid. It’s no longer a secret that China has climbed to the top of Africa’s trade partner ladder, going from a paltry $1 billion in bilateral trade in 1980 to a record $200 billion in 2014. Fueled by loans, foreign direct investment in critical infrastructure projects, and advantageous prices for exports, this primarily economic relationship is now slowly morphing into a more comprehensive partnership that risks displacing the existing balance of power on the continent. For example, a Cornell University study from 2013 uncovered evidence that “trade with China generates foreign policy consequences,” especially concerning the voting patterns of African countries inside the United Nations General Assembly. What’s more, since Africa is already host to a complex network of military alliances and defense agreements signed either with former colonial masters or the United States, China’s expanding influence on the continent at the behest of Xi’s “ one belt and one road” vision will likely cause frictions and push Beijing into taking a more active stance. Djibouti is a case in point. The country has contracted Chinese loans and is currently developing 14 lavish megaprojects, worth some $9.8 billion, with Beijing’s help. However, Djibouti is also arguably Washington’s most important African ally and plays host to the biggest American base on the continent, Camp Lemonnier. Home to some 4,500 personnel, fighter planes, Predator UAVs and helicopters, the base is the principal hub for drone operations in Yemen and Somalia and wider U.S. counterterrorism campaigns throughout the region. Sensitive to national security issues, Washington heavily protested against a 2014 security and defense agreement Djibouti signed with Beijing, and agreed to a doubling of the rent it paid for Lemonnier in the hopes of maintaining the country’s three-going-on-a-litigious-fourth-term president, Guelleh, on its side. In the run-up to a May 5 visit by Secretary of State John Kerry, U.S. lawmakers even sent a letter calling out Guelleh’s double standards toward Washington as well as his long-standing human rights abuses and autocratic tendencies. The May 10 announcement of a future Chinese base will surely not go down well in Washington. In the context of a growing rivalry between Beijing and Washington, Djibouti showcases that certain strategic points are underpinned by a zero-sum logic, where one power’s gain can only come at the other one’s loss. What this means is that the idea of the MSR as a purely economic initiative is fanciful to say the least. It should also be noted that the MSR initiative is not financed through grants or development aid but through loans, some of which carry high interest rates. The IMF expressed concern at Djibouti’s own capacity to repay the billions of dollars borrowed from Beijing. Furthermore, the recent kerfuffle in Sri Lanka and the Maldives—where the governments accepted loans at unsustainable rates and were force to cede control to Beijing of strategic assets it helped finance in exchange for relaxing conditions—presents a different narrative for the MSR. According to this latter interpretation, the project is nothing more than a long-term strategy through which China gets to have its cake and eat it too—a government contracts a development loan, builds infrastructure useful for both its needs and China’s, before ceding administration of the asset to Beijing over solvency concerns. If that were the case, then the MSR would enforce a line of analysis dubbed the “string of pearls” model, according to which China’s maritime strategy is to disguise military bases across the South China Sea and the Indian Ocean, all the way to Africa, as commercial deep-water ports. A PLA-N base in Djibouti would most certainly give a nod to this view. The author is a London-based researcher. After Djibouti Base, China Eyes Additional Overseas Military 'Facilities'A Naval Base on the Horn of Africa for China?Chinese Navy Frigates Trail Japanese Helicopter Destroyer in the South China SeaWhat the Trump Administration's Decision to Disinvite the Chinese Navy From RIMPAC 2018 MeansAs China's Type 001A Carrier Enters Sea Trials, What's Next for the PLAN's Carrier Force?